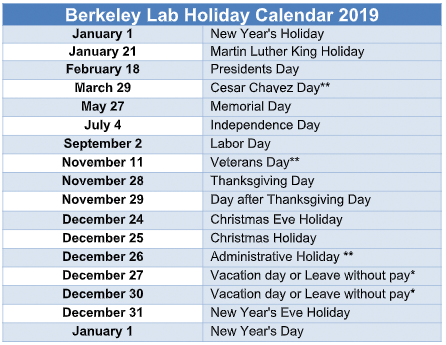 Subscribe to the Berkeley Lab Holiday Schedule via Google Calendar or ICS. Contact [email protected] for Google Calendar/ICS subscription help. ** Eligible employees have the option to take one of these days as a holiday. Those employees taking Cesar Chavez or Veterans Day as a Floating holiday must use a third vacation day during the Administrative day after Christmas. See the Implementation Guidance for information on eligibility and time entry procedures. The Laboratory holiday policy is contained in the Requirements and Policy Manual (RPM), Holidays.